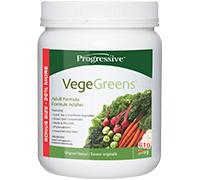 VegeGreens is a comprehensive combination of over 60 land, sea and cruciferous vegetables, as well as super green foods, EFAs, pre and probiotics, enzymes and herbal extracts. With 9 distinctive blends of green foods and plant extracts, VegeGreens supplies an extraordinary spectrum of nutrients ranging from the rare trace minerals found in sea vegetables to the health-enhancing compounds exclusive to cruciferous vegetables. Each small scoop provides the nutrient equivalent of 6 to 8 servings of fresh vegetables. The nine botanical families in VegeGreens® are Green Food Concentrates, Sea Vegetables, Land Vegetables, Cruciferous Vegetables, Essential Fatty Acids, Phytonutrients, Standardized Herbal Co-factors, Digestive Support and Fibre. These distinctive blends supply an extraordinary spectrum of nutrients that can only be obtained by consuming the entire rainbow of vegetable colours. The power of VegeGreens comes from the numerous individual nutrients that each blend contains, as well as the synergy between the blends.